SEATTLE (AP) — In a park in the middle of a leafy, bohemian neighborhood where homes list for close to $1 million, a tractor’s massive claw scooped up the refuse of the homeless - mattresses, tents, wooden frames, a wicker chair, an outdoor propane heater. Workers in masks and steel-shanked boots plucked used needles and mounds of waste from the underbrush. The rising numbers of homeless people have pushed abject poverty into the open like never before and have overwhelmed cities and nonprofits. The surge in people living on the streets has put public health at risk, led several cities to declare states of emergency and forced cities and counties to spend millions - in some cases billions - in a search for solutions. Homelessness is not new on the West Coast. 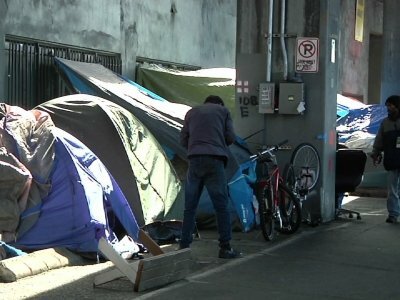 But interviews with local officials and those who serve the homeless in California, Oregon and Washington - coupled with an Associated Press review of preliminary homeless data - confirm it’s getting worse. People who were once able to get by, even if they suffered a setback, are now pushed to the streets because housing has become so expensive. — Official counts taken earlier this year in California, Oregon and Washington show 168,000 homeless people in the three states, according to an AP tally of every jurisdiction in those states that reports homeless numbers to the U.S. Department of Housing and Urban Development. That is 19,000 more than were counted two years ago, although the numbers may not be directly comparable because of factors ranging from the weather to new counting methods. — During the same period, the number of unsheltered people in the three states - defined as someone sleeping outside, in a bus or train station, abandoned building or vehicle - has climbed 18 percent to 105,000. — Rising rents are the main culprit. The median one-bedroom apartment in the San Francisco Bay Area is significantly more expensive than it is in the New York City metro area, and apartments in San Francisco are listed at a higher price than those in Manhattan. — Since 2015, at least 10 cities or municipal regions in California, Oregon and Washington - and Honolulu, as well - have declared states of emergency due to the rise of homelessness, a designation usually reserved for natural disasters. With alarming frequency, the West Coast’s newly homeless are people who were able to survive on the margins - until those margins moved. “We literally turned the corner one day ... and there were 48 tents set up on this one block that hadn’t been there the day before,” he said. “How many social workers have you met that go into the woods to follow up with the homeless population and to help with mental health? This is a bit of a hybrid position, certainly, and maybe it’s not exactly the role of a police officer - but it’s a creative approach to find a solution to the problem,” he said. All along the West Coast, local governments are scrambling to answer that question - and taxpayers are footing the bill. A team of specially trained police officers and social workers has also been visiting homeless camps to try to place people in shelter. After repeated visits - and with 72 hours of notice - the city cleans out the camps and hauls away abandoned belongings. Seattle’s DESC operates 1,200 so-called “permanent supportive housing units” -housing for the mentally ill or severely addicted who can’t stay housed without constant help from case managers, counselors and rehabilitation programs. The nonprofit completes a new building every 18 months and they immediately fill; at any given time, there are only about eight to 10 units free in the whole city - but 1,600 people qualify. Associated Press writers Janie Har in San Francisco, Julie Watson in San Diego and Chris Weber in Los Angeles contributed to this report. AP photographers Jae Hong in Los Angeles and Ted Warren in Seattle, and AP videographer Manuel Valdes in Seattle also contributed.